Truck flips off exit ramp onto Interstate 95. 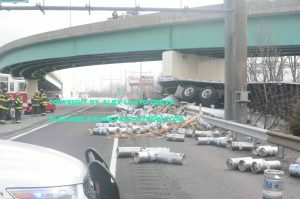 Two injuries were reported today, when a tractor trailer traveling south on I-95 exited the road onto the ramp for the Park and Ride. The truck then mounted the retaining wall and flipped over, dropping about 30 feet, onto the Interstate below, hitting a passenger car. No one was killed. 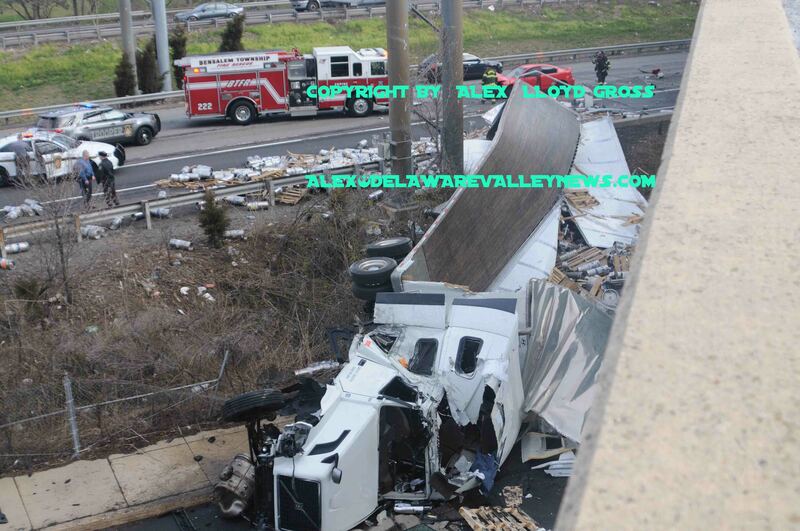 Alex Lloyd Gross Photo- Delaware Valley News.com The crash scene . as officials look from the overpass. The crash looks like a bomb went off, with cylinders that the trailer was hauling laying all over the road. Part of the truck was on the road and the tractor portion was on the Par and Ride driveway. The driver was trapped by debris and fire crews from Bensalem Twp. went to work and quickly removed him. The driver of the passenger car sustained moderate injuries, Pennsylvania State Police said. Traffic in both directions is backed up heavily. One lane north is getting by, until wreckers can get into position to remove the truck. Then all northbound traffic will be exiting at Woodhaven Road. The Park and Ride remains open and no vehicles parked there sustained any damage. An investigation continues to determine why the truck flipped and what the driver was doing exiting onto the Park and Ride.